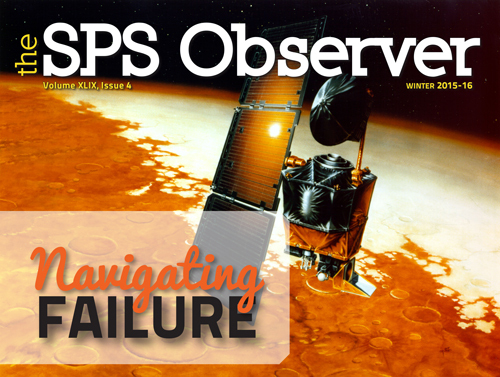 SPS News - Issue 78 The SPS Observer explores "Epic Physics Fails"
Epic Physics Fails The Winter 2015-16 issue of The SPS Observer explores three high-profile projects that failed and what those failures meant for the communities involved. Additionally, your own "Epic Physics Fails," both mortifying and hilarious, are examined. Also, with many chapters gearing up for PhysCon, SPS President DJ Wagner reflects on getting ready for the big event. Read the Winter 2015-16 issue. In 2016, funds raised through "The π Awakens" campaign will help fund student travel to Sigma Pi Sigma's 2016 Quadrennial Physics Congress (PhysCon), November 3-5, in Silicon Valley. Report Suggests How APS Can Be More Inclusive of LGBT Physicists The APS Ad-Hoc Committee on LGBT Issues recently released a report entitled "LGBT Climate in Physics: Building an Inclusive Community." Findings include that LGBT physicists experience workplace pressure to “not act too gay,” that those with additional marginalized identities face greater discrimination, and that transgender individuals experience the most hostile climate. Over a third of LGBT physicists surveyed considered leaving their department in the last year. The report recommends specific ways for APS to make the physics community more inclusive and safe, including establishing a broad-based Forum on Diversity and Inclusion. The report is available to view or download on the APS website. Attending the APS April Meeting? SPS Can Help! SPS members attending and reporting on professional physics meetings are eligible to receive $200 in travel reimbursement. Applications are always being accepted. Apply Now! Presenting Your Work at a Meeting? SPS members presenting original work at a national AIP member society physics meeting are eligible to receive $200 in funding. A limited number of awards will be offered. Apply Today! Register now for the APS April Meeting in Salt Lake City, UT. Get more information. Zone 13 – Mar. 31-Apr. 2, Zone 4 – Apr. 8-9, Zone 17 – Apr. 9, Zone 5 – Apr. 15-16.